New investment opportunity available now! Yesterday we launched an investment offer in Mytown Technologies Ltd. Mytown seeks to raise equity ordinary share capital of £75.000 at £0.41p per share. That’s a valuation of circa £1,200,000. The company’s exit route is an IPO targeted for Q3/Q4 2019. Should the full capital of £75,000 be raised and Mytown delivers on its business plan, its potential value could be close to £10,000,000 at the time of the IPO. This offer is open until December 15th. Funds raised will be used to propel the Mytown business by launching a new App which will enhance their local community platforms. Mytown is an exciting company and a fairly new addition to our line-up. Today you will find Mytown in our Ignite segment but we are confident the company soon will be ready to move up in the ranks. Since the launch the unique Mytown platform has been successfully introduced in 7 towns across the UK. 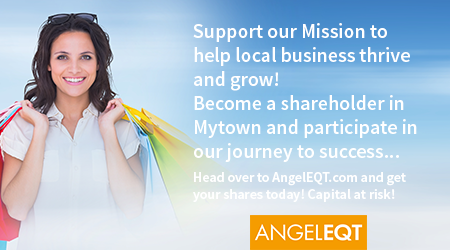 Head over to www.angeleqt/mytown to see all details regarding this new investment offer. NB All members of ABC have full access to angeleqt.com and can log in using their ABC username and password.